(1) When the temperature is between 20℃--26℃(68℉--78.8℉)and the humidity is between 50%RH~70%RH,''Comfortable'' will be displayed. (2) When the humidity is higher than 70%RH,''Wet" will be displayed. (3) When the humidity is lower than 50%RH,''Dry" will be displayed. 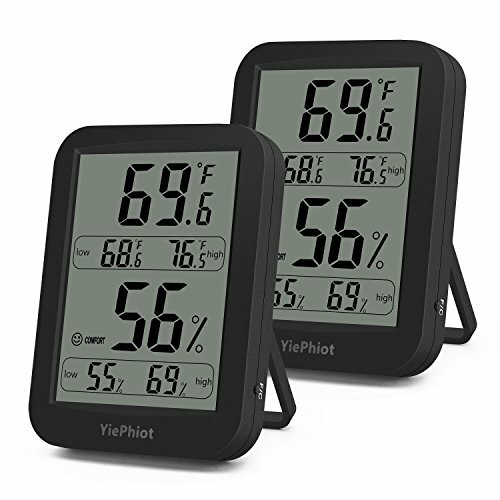 High & Low Records: Displaying temperature、humidity maximum or minimum indoor temperature and humidity memory function. Comfort Level Indication: Humidity Meter with humidity level icon indicates air conditions -- DRY/COMFORT/WET. High Quality: Our product is Low power consumption, high accuracy and high stability. And powered by AAA battery (included). ℉/℃ Selector: ℉/℃ switch function, which means our products can display Celsius temperature and Fahrenheit temperature to meet demand of multi-groups. Three Placing Options: Huang on the wall with hanging hole, place on the table with retractable bracket/holder, stick on refrigerator with magnet.